Res Ipsa Knit With Her: Why is it so hard to knit for someone else? I don't think I've ever gone to a yarn store and left without some yarn. Even when I've gone for a specific purpose like handles or a pattern - there is always something that calls to me - some yarn just begging to be knit. Now maybe I've just publicly admitted that I have absolutely no self restraint (fine - I'll admit that) but my point is that when I go to the LYS looking for yarn for someone else I find that nothing is "quite right." Why is that? I have joined the International Scarf Exchange again and have been assigned my pal. I've read her likes 3 or 4 times and set off to the yarn store. I walked around and around. Nothing seemed to work. Too thick, too thin, not soft enough, not the right colors and finally I settled on some nice yarn and bought 3 skeins (I'm always afraid I will run out). Then I kept looking at the yarn, showing it to my SP8 pal Brooke and worrying that one of the colors that ran through it might not appeal to my pal. So I returned the yarn and got some yummy soft yarn that seemed perfect. I knit a swatch and quickly realized it was way too think for the pattern I had chosen. Even if I cut back some stitches each side was going to be about 10 inches wide! So then I had to decide - a different pattern or different yarn. I had my heart set on the Matthew scarf so off I went to a different yarn store. I walked around for about 45 minutes (it's not that big!) once again finding nothing that was quite right. I found LOTS of yarn I wanted, but for some reason nothing seemed quite right for my pal. Finally I found some Koigu that seemed like the perfect color. I'd heard that people love Koigu and that to knit thicker things you just put 2 strands together. So I got it. 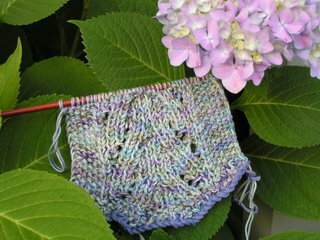 Now I'm making the scarf with the Koigu Painters Palette and I do love the colors - they remind me of a Monet painting. But I'm worried that it is not a soft and snuggly yarn! It's funny because at the Yarn Harlot event I was talking to a nice woman in line behind me and she asked what I liked to knit. I told her I was doing some exchanges and she said, "Really? Don't people just knit up crappy stuff and send it?" I had to laugh - if only she knew the stress and trauma we all go through in these exchanges! Maybe I should just go knit something for myself - I know I have some yarn . . . . Colors are beautiful. Matches your hydrangea (sp?) perfectly! Love the scarf. I am 4 stitches from casting off the beaded bum-gloves!! It was after midnight and I could not do one more stitch. I'm so happy that another ISE3 member is going through the "I want it to be special. I want to be perfect"s. Me, too. Your scarf is gorgeous. You made great choices - how many skeins of koigu did you end up using? Was the scarf very long?